Thanking Others « Customers Rock! « Is Ambient Marketing Good for Customers? One way to differentiate yourself and your business from your competition is by sending your customers hand written thank-you notes. Now don´t be telling me you don´t have time. If you want to differentiate yourself from your competition, this is one way to do it. Outside sales people can carry a stack of notecards, envelopes, and postage with them and can write them in between appointments or cold calls. Inside sales people can write them during non-peak hours. Today, Glenn gives us some great resources to help us write those notes. He doesn’t let us use poor handwriting as an excuse to get away from this, either! Because my signature is illegible, I’ve ordered notecards with my name embossed on them. Each note takes about 5-7 minutes from first draft to addressing the envelope. It’s time well spent. I have another resource to add: SendOutCards. I met one of their distributors, Robert Lipton, recently at a San Diego Chamber of Commerce meeting. These cards are generated completely on-line, but they are then printed out with your personal message, as well as photos if you’d like, and sent to the recipient based on your schedule. I tried out Robert’s card site, www.typeclickrelax.com, and sending the card was a very quick process! Since I do so much on-line, this is a great way to get my thank-you notes (both to customers and partners), as well as congratulations, birthday greetings, and get-well cards completed and out the door. I didn’t try their handwriting duplication, but you can have them turn your writing into a font and use it to print on the cards; Glenn, you may not want to do that. 🙂 All in all, a pretty cool tool! 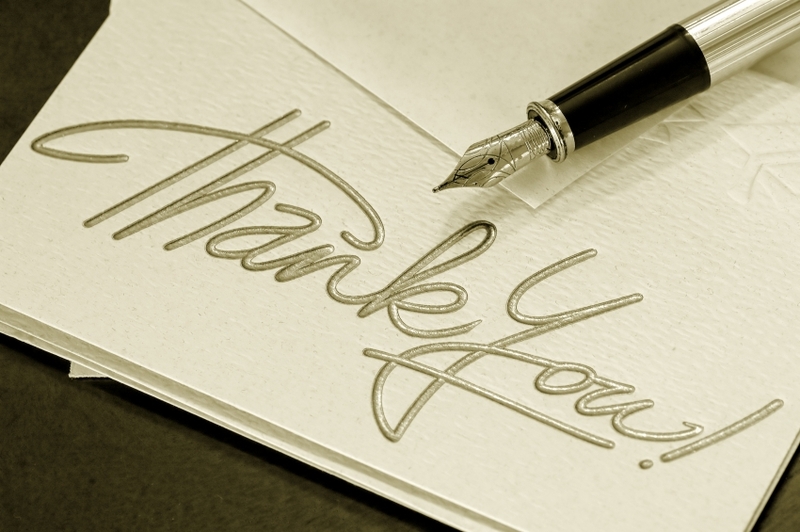 Whichever way you do your thank-you notes, just make sure you do them! You will be remembered for them. This entry was posted on April 10, 2007 at 7:57 pm	and is filed under B2B Marketing, Customer experience, Customer service, Marketing. You can follow any responses to this entry through the RSS 2.0 feed. You can leave a response, or trackback from your own site. We have our FSR’s (financial service reps) send out thank you cards after we do a loan for a member and the response (and feedback) from both the membership and the employees is wonderful! Great to see this happening in the financial services world! Good point about how it makes employees feel, too. Thanks for adding to the conversation! Tell me more about how it “left its mark”! Robbie – I used to be an MSC (Member Service Consultant) for a credit union myself and coulnd’t believe how powerful sending handwritten notes to my clients was. I received a ton of repeat business and new referrals because of it. I checked into send out cards myself and found it to be great for consumers sending a card here and there(christmas card, birthday card,etc..) but not what I would send out from my office to my clientele. Multi level marketing is great for some but I didn’t want to send out a card that printed Send out Cards (they promted themselves) on the back of the cards I sent out. Plus I found sending multiple cards at once difficult. When you send out personal handwritten notes, you touch people in unexpected ways. And when you send out unexpected notes to your customers showing genuine appreciation, you can earn their business for life. I send out peronsal handwritten notes, using SendOutCards, everyday and get calls from people telling me they were touched and actually crying on the phone or conveying that they were inspired in some way. I have always sent out handwritten notes, but SendOutCards allows me to do it in 60 seconds or less so I can reach a lot more people. And what I found is that it is the actual message that counts. From a business perspective, I have seen people’s business increase over 400% in less than a year using SendOutCards. I personally grew a safety business in 2006 and added over $500,000 in revenue using SendOutCards. You can automatically send out card campaigns at timed intervals, thanking customers, showing appreciation, asking for referrals, upselling and cross selling, and wishing them well on their birthday. For $4.00 per customer per year you can definitely earn a customer for life. I always like to ask people what the lifetime value of their customer is? Michael, thanks for introducing me to Hoard. I hadn’t heard of it before. I will check it out. I am glad that you have the thank you note habit. The most important thing is getting the notes out the door, which seems to be difficult for most people. Thank you for your ideas, Robert. I agree, the most important thing is getting into the “thank you note” habit! Love the examples! We currently are in the process of sending one card per day to a customer (we are internal support). Over the course of the year, we will reach nearly 300 of our customers in a very personal manner. Each note takes 5 minutes and is very focused on the experience we had with them. Brandon, that is such a wonderful way to remember your customers. One a day is very do-able! Thanks for sharing your ideas, too. slightly certain I’ll be informed many new stuff proper right here! Best of luck for the following! Online Marketing, b2b, emarketing and everything around is good to see and read. I wish you awesome 2018!! By the way, I click your page BLOGTITLE on google. Nice!